The famous scientist never travelled without his beloved violin, “Lina.” His affair with music began with violin lessons in Munich at the age of 5. However, his early experiences with the instrument seem at best perfunctory and, at worst, antagonistic (one anecdote has him throwing a chair at his teacher, who left the house in tears). This gushing recollection must inevitably prompt the question, raised in every account of Einstein and music—was he really any good? 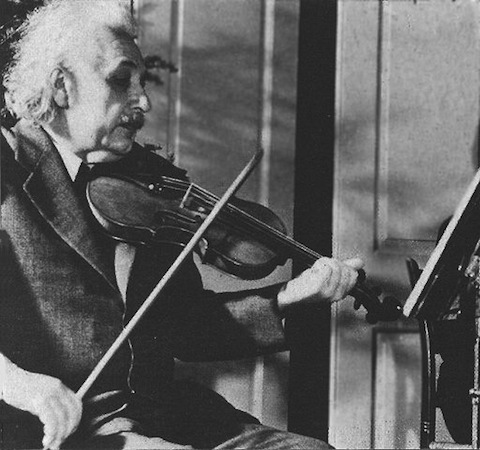 Since he played mostly for his own enjoyment, the answer seems irrelevant; yet, as particle physicist Brian Foster says in the video above, Einstein was “competent.” In his Berlin years, he played with renowned musicians like Austrian violinist Fritz Kreisler and pianist Artur Schnabel (as well as with founder of quantum theory, Max Planck). His scientific notoriety garnered invitations to perform at benefit concerts. One critic remarked, “Einstein plays excellently. However… there are many violinists who are just as good.” Another concert-goer quipped, “I suppose now Fritz Kreisler is going to start giving physics lectures.” Accounts of his abilities do differ. Einstein relished Mozart, noting to a friend that it was as if the great Wolfgang Amadeus did not “create” his beautifully clear music at all, but simply discovered it already made. This perspective parallels, remarkably, Einstein’s views on the ultimate simplicity of nature and its explanation and statement via essentially simple mathematical expressions. While the interpretation of Einstein as a “realist” has its detractors, his insistence on the beauty and simplicity of scientific theories is not in dispute. Foster points out above that part of Einstein’s legacy is his push for beauty, unification, and harmony in our physical understanding of reality, a push that Foster credits to the scientist’s musical mind. Now we know why Einstein was a genius, he was a musician! Yeah, Einstein was great. At everything!